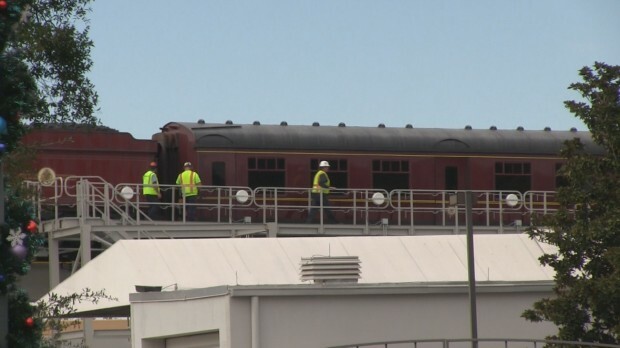 Testing for the Hogwarts Express train ride that will take guests between both Universal parks has begun, and we have a look at its slow-moving test. The Hogwarts Express is expected to include projections inside the cars to give guests the feeling of traveling through the countryside on the way to Hogsmeade or Diagon Alley, with different experiences each route. In what may be a first for any park attraction in the world, the train will transport guests between two different theme parks, requiring guests to have a two-park or annual pass. 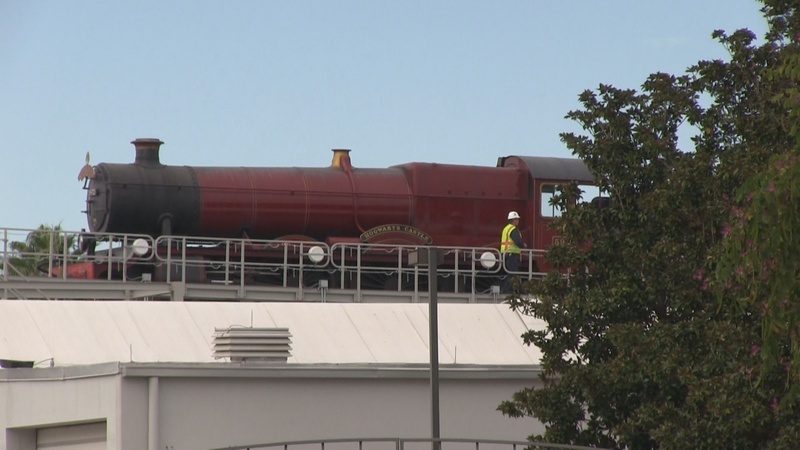 The above photo shows a Hogwarts Castle sign on the locomotive, possibly suggesting this particular train will be going from Diagon Alley to Hogsmeade. For a detailed look at concept art for Diagon Alley and what’s to come, visit our blog at AttractionsMagazine.com. Great breaking news of Hogwarts Express, and a very good sign that all is on track for a summer opening perhaps? WDW Monorail does obviously transport guests from the immediate vicinity of one park to the immediate vicinity of another, however, with the monorail you were not being transported from inside one park to another nor did it require a ticket to experience. I believe this is what was being suggested. Regardless, everything is looking fantastic and I cannot wait for it to open! Well, technically the monorail at WDW is doesn’t transport guests between parks at all, as all of the stops are located outside the entrances to the individual parks that it services. By contrast, the Hogwarts express will transport guests from a point within IOA to another point within Universal Studios. An interesting side-effect of this difference is while guests riding Hogwarts will require a ticket to BOTH parks, it is technically possible to ride the full length of the WDW monorail without having a ticket to ANY park! This would make a great video diary! A Grand Day Out On the WDW Monorail! Just a thought…what if that is the full speed test and the ride(or whatever you call it) will take 15 – 20 minutes or so? Also, any thoughts to whether there will be a less intense version or something for little ones (since this ride is also transportation)?